The stunning industrial-style interior of Cassiopeia, Springwood and Katoomba. With an abundance of cafes lining the streets of its towns, the Blue Mountains has no shortage of coffee. With so many to choose from, here are the best cafes worth a stop in the Blue Mountains according to a local. A local secret that deserves to be shared, the Red Door Cafe boasts some of the best coffee in the Blue Mountains. A soundtrack of frothing coffee, eclectic 80s rock and contemporary techno meet you as you walk through its namesake red door, with local artists’ work adorning the lining-board walls, hanging plants and a blackboard sporting daily specials. The food, just as good as the coffee, includes dishes like beef and grilled capsicum quesadillas, with tomato salad and hibiscus mayonnaise, hearty (locally made) Tuscan sausages with gravy and mash potato, as well as a delicious vegetarian lentil burger with satay peanut sauce. The Blue Mist Cafe, owned by an Englishman named Alan (who has no aversion to telling jokes to a cafe full of patrons), is a prime breakfast spot for locals, who travel from around the area for a serve of scones or a hearty big breakfast. A delicious spread at Blue Mist Cafe, Wentworth Falls. A cosy space, the Blue Mist Cafe has booths on the ground floor and a lounge suite on the upper level, where you’ll also find a second-hand bookshop; perfect for reading and relaxing as you enjoy pancakes, pot pie or a breakfast smoothie. There’s a lot to choose from in the food and drinks stakes here, but don’t skip the Snickers thickshake (order it extra thick) – it tastes like dreams. A ‘chocolate bar’, conveniently situated off the highway in Lawson, is the perfect stop in on your way up the mountain. With a large collection of handmade chocolates and desserts, there is no shortage of snacking options to complement your coffee. Arguably the best cappuccino in the Blue Mountains, potentially because of the quality chocolate Rust and Timber use for dusting your froth, this is a must-try for anyone visiting the area. Named after the purple wisteria vine that winds its way along the arbour at the front of the cottage, Wisteria Place is the most calm and relaxing cafe on the mountain. With exceptional staff, and equally good coffee, Wisteria Place is the perfect spot to reconvene after a big day of exploring. Enjoy a Campos coffee at cosy Wisteria Place, Leura. The owner, another Alan (also British!) is a charming host, and his partner Pavolina is always happy for a chat. The pair share the cafe with another couple, from the Czech Republic, who open the cafe in the evening as a Czech restaurant, Wisteria Night, serving hearty dinner options from their homeland. If stopping in for dinner try the schnitzel, and if you’re heading there for coffee try the carrot cake – it is divine. Dbl, named after a short shot of coffee, is as you would expect. Its owners are coffee connoisseurs, and have perfected their art. Dbl Ristretto also offers an alternative to the often hearty and heavy mountains food, with healthy options throughout its food and drink menu. The drinks include fresh juices and turmeric lattes, whilst food options include raw desserts and, my favourite, the mushroom, parmesan, rocket and pesto toasted sandwich on sourdough. Lattes at the ready at Cassiopeia, Springwood and Katoomba. With two separate cafes (just in the Blue Mountains) it is abundantly clear that the owner, Zac, knows how to make a coffee. Cassiopeia, a great place for a pit stop. Zac travels to South America to source the best coffee beans to bring back and roast (at a dedicated roastery) before delighting our noses and tastebuds. 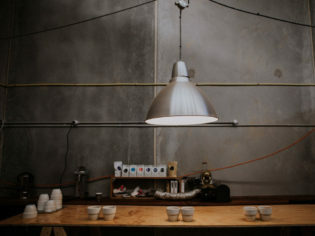 Cassiopeia also distributes its coffee beans to other cafes, in both the Blue Mountains and beyond. Table for two at Cassiopeia, Springwood and Katoomba. You’ll find The Laneway, a small cafe frequented by locals, just off the main street of Leura, down a laneway that leads to the post office. The Laneway is one of many cafes that uses the delightful Cassiopeia coffee beans, meaning that its coffee is always delicious. To pair with its coffee, you can order a gourmet toasted sandwich. Fillings change seasonally and current favourites are the egg, bacon and American cheese toastie, the pulled pork toastie and the croque monsieur (with the cafe’s famous gold mustard sauce). Owned by the local Murphy family, you can expect that after a few visits your coffee order will be remembered, and nothing more than ‘the usual please’ is necessary. Butternut is a brilliant cafe with fantastic coffee, food and service. Coffee is a must when visiting this cafe, but if you are feeling peckish, try the BLAT on Turkish bread, the twice-fried wedges with aioli or the gooey homemade brownie. You won’t be disappointed. Butternut also offers pancakes of the day, which have included brownie pancakes, banana pancakes and maple bacon pancakes. This cafe, with inner-city Sydney coffee prices, certainly knows what a good cup is worth. Undoubtedly some of the best coffee on the mountain, Anonymous is a must-stop on your way to the Megalong Valley. A popular spot for visitors: Anonymous Cafe, Blackheath. Its food menu is comprehensive, and dishes include all-day breakfasts like brioche French toast with seasonal poached fruit; and scrambled eggs with sourdough and house-made relish. My top tip? Grab a coffee to go, and a takeaway pie from the bakery two shops up – which uses local, organic meat from the butcher up the road – and head to nearby Evans Lookout to enjoy your bounty with some glorious views. Looking to spend some time in the Blue Mountains? Check out our ultimate Blue Mountains destination guide and plan it right.